On the occasion of 49th Raising Day of Himachal Home Guards and Civil Defence Organisations, Chief Minister Prem Kumar Dhumal said that fifty firemen, 10 havaldar instructors/quartermaster Havaldar and four company commanders more would be sanctioned for the existing strength of the Civil Defence and Fire Services. Function held at historic Ridge ground. Chief Minister said that the State Government was committed to strengthen the organization keeping in view its and valuable services. He said that Himachal Pradesh happened to be the First State in the country which had amended the Himachal Pradesh Home Guards Act in year 2002 to pave the way to retain services of Home Guard volunteer’s upto the superannuation age of 58 years. He said that the Home Guards Department has been brought under State Plan for the First time in year 2008-09 with a view to create its departmental infrastructure to facilitate efficient services to the people and Rs. 2.60 crore had been allotted to the department during past two years. He said that 16 flats had also been purchased from HIMUDA at Parwanoo to facilitate better service delivery by the volunteers. He said that the Himachal Home Guards had the proud privilege to participate in the Republic Day Parade in New Delhi twice and for having won 12 gallantry, 9 distinguished and 94 meritorious medals from the President of India in recognition of the valuable services rendered to the nation. Chief Minister said that the organization had sanctioned strength of 8,000 volunteers and the State Government had been making efforts to requisition services of majority of volunteers for maximum period of time in an year. He said that the State Government had been liberal towards the volunteers and had trice enhanced their daily allowance first time from Rs. 150 to Rs. 170 and now further to Rs. 200, thereby providing financial benefit of Rs. 18,000 to each volunteer in a year. He said that volunteers were also being provided 15 percent reservation in recruitment to police constables, jail wardens, forest guards and so far 151 volunteers had been absorbed as police constables, 82 as firemen and 75 deployed as Jail Wardens. He said that with a view to acquaint volunteers to the latest trends in delivery of emergency services and maintenance of law and order conditions a Training Centre will soon be coming up in Shimla. 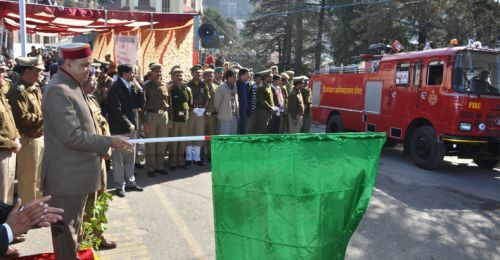 Chief Minister said that the State Fire Service was being strengthened by providing modern fire fighting equipments, fire tenders and advanced fire technology mist back packs. He said that 39 new fire tenders had been added to the fleet strength on December 6, 11 more fire tenders had been added to raise the strength to 50 besides providing six advanced fire technology mist back packs. 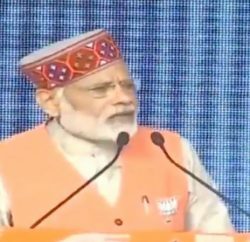 He said that seven fire station buildings had been inaugurated during past 18 months, at Chhota Shimla, Una, Palampur, Hamirpur, Bilaspur, Nalagarh and Rohroo. B. Kamal Kumar, Additional Director General of Police and Commandant General of Himachal Home Guards, welcomed the Chief Minister and thanked him for boosting the morale of the volunteers by his benign presence on the Raising Day. He said that with the updation and training of the volunteers over 500 accidents had been averted successfully. He detailed the other activities of the organization and said that the Silver Jubilee would be celebrated next year. 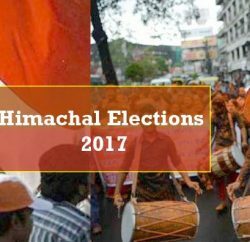 S.R.Sharma, Inspector General of Police and Deputy Commandant General of Himachal Home Guards, proposed vote of thanks. An impressive display was given of the rescue skills of the volunteers to mark the celebration. Ganesh Datt, Vice Chairman, HIMUDA, Dr. D.S.Manhas, Director General of Police, I. D. Bhandari, Director General of Jails and CID, Onkar Sharma, Deputy Commissioner, Shimla, Prithvi Raj, Inspector General of Police, other senior police, home guards, civil defence and civilian officers were present among others on the occasion.